From low voltage security lighting to landscape lighting, there are plenty of options to make your yard or other outdoor space a beautiful place to be. You may want to showcase particular flowers or plants, or you may want to add nighttime ambiance to your patio, arbor, or fence. LED landscape lighting is cool to the touch, so it won’t damage anything you put it next to. LED lights are long-lasting and require little maintenance. Best of all, your electric bills will stay low, and you’ll have a great-looking yard you can enjoy day or night. No matter what type of outdoor lighting you’re thinking of for your property, be sure you have a plan laid out. Know where to put your lighting before you start installing it, and you’ll be happier with the outcome. 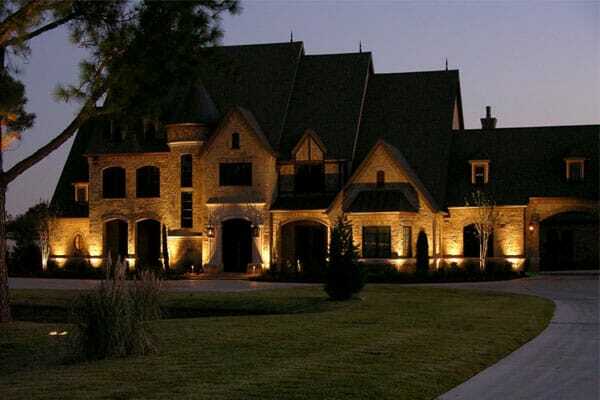 When you work with us, we will help you create an outdoor lighting plan that gives you security along with beauty for your yard, patio, or other outdoor areas. With a population of nearly 380,000 people, Arlington, TX is a popular and beautiful place to call home. Its proximity to Dallas helps, but there are plenty of other great reasons to live there. The University of Texas at Arlington is there, along with an assembly plant for General Motors and Globe Life Park. AT&T Stadium is in Arlington, as well, and you’ll also find Six Flags Over Texas, the headquarters of American Mensa, and the International Bowling Hall of Fame. That’s in addition to the shops and restaurants, parks and green spaces, and lovely historic areas that make up Arlington. It’s a great place to live and work, and it continues to grow and develop. One of the best things about Arlington, other than having so much to do in the area, is the weather. Summers are hot, but the days are long and the evenings are warm, so you can be outside doing all kinds of things. Even in the winter time, the weather isn’t usually too cold or severe, so you can have fun outdoors nearly all year round. George did an exceptional job communicating, designing, having his team implement the installation, and following up. This was all done in a timely manner - from the time we originally contacted him until the day of installation was less than a week. The total installation took several hours. We were able to enjoy the lighting on the same night. It is gorgeous! Excellent design, installation and set up. Work was performed as stated per our agreement. Work was done on time at the price agreed upon. Technicians were pleasant. Communication during the process was exceptional. Very happy. Jerry and his team did a phenomenal job with our new backyard lighting. My wife and I sit outside almost every night. It's beautiful! Great service and looks beautiful! 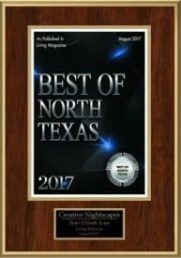 We loved working with Creative Nightscapes. George is very easy to talk to and does not pressure you to make a decision or buy more than what you need. He and his team are polite, efficient and professional. George provided outstanding service to me and my brother. We are looking forward to sharing his name and this company to our friends and relatives. It has been a pleasure working with George. He was very personable and professional as he explained how the lights that were chosen would look around our home. The lights around our home are absolutely beautiful. I am going to refer "Creative Nightscapes" to my friends and relatives. Beautiful accent up lighting on the home and trees. Moonlighting on the driveway entrance and deck lighting along the side of the driveway to accent the stone retaining wall and illuminate the side of the driveway. Installed kichler lighting system in Arlington. Facade lighting and up and down lighting from oak trees on property. Reviewing the up lighting and moonlighting on the walkways, driveway, pool deck and steps. It looks fantastic. Removed all high voltage lighting and installed low-voltage Kichler LED lighting at the community entrance for Royal Dominion. Placed up lights to accent Crepe Myrtle trees, white columns, community monument sign, canopies of Oak trees, entry sign, and boulders. Mounted down lights to highlight landscape below, driveway to exit, and call box. Removed builder lights from front of home. Installed Kichler LED outdoor landscape lighting at home in Forest Hills. Placed up lights to accent the facade of home, front entry, trees along back side of pool, trellis landscape, and planter boxes near pool. Mounted down lights in trees to highlight yard below and courtyard. Mounted down lights and hardscape lights under eaves to illuminate driveway area, pool deck, walkways, star, and entrance to patio. Installed Kichler LED outdoor lighting at home in Meadow Park Estates. Placed up lights to accent the facade of home and front entry way. Mounted down lights to create moonlight effect and illuminate yard, walkway, driveway, and landscape greenery. Installed Kichler LED outdoor lighting at home in Oak Canyon. Placed up lights to accent facade of home, bay window columns, and front entry. Mounted down lights in trees and eaves to create moonlighting effect and illuminate front/back yards, driveway area, gate, and front walkway. Removed existing fixtures and installed Kichler LED outdoor landscape lighting at home in River Bend. Placed up lights to accent facade of home. Mounted down lights in trees and eaves to create moonlighting effect and illuminate driveway, walkways, and yard.